One Hot Stove: Happy Diwali! This is a traditional earthenware diya that I lit for diwali...I wish everyone everywhere a wonderful festive season and a year filled with peace and happiness, and good food and good friends...everything that makes for a rich life. Earthenware diya is just beautiful. I love your earthenware diya. 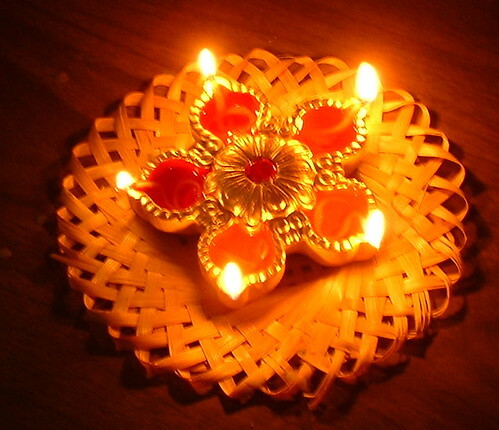 Happy Diwali, Nupur! Happy Diwali Nupur! I assume this marks just the beginning of the festival - how long does it last? Happy Diwali to you too. Found your blog vis a google image search for Diwali. Will visit again.. you are a foodie too eh? Also Gharge? Wow I haven't heard that word in ages. You aren't a Maharashtrian by any chance are you? Not that it matters but since it's a Marathi word am asking. Thanks..later.. Happy Diwali Nupur! Delicious recipes and Wonderful Diya with a Wonderful smile. Wish u a happy Diwali! n wishes for such a Sweet blog. EoMEoTE #11: Seventies Song Lyrics!